Ben Ling usually sends us Xperia concepts, but today he made an exception and created the iPhone 6 and iPhone 6 pro concepts. Both devices come with 4.55 inch Retina displays with Corning Gorilla Glass touchscreens, supporting multitouch for up to 10 fingers. The screen supports a 720 x 1280 pixel resolution and the handsets measure 11 mm in thickness for the model with keyboard and 7 mm for the standard iPhone 6. 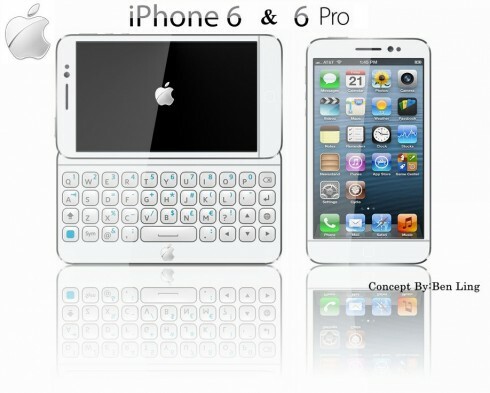 They have LTE, a quad core Apple A7 quad core CPU at 1.7 GHz and a 13 megapixel iSight camera at the back with LED flash. The front camera is a 2 MP unit that does 1080p capture. The device uses a microSIM card slot for some reason and runs iOS 7.0. Other specs include 2 GB of RAM, a Li-Po 2100 mAh battery and 16/32/64 GB of storage. The iPhone 6 weighs 120 grams, while the iPhone 6 Pro weighs 139 grams. The 4.55 inch format feels like a sweet spot for the future iPhone design and I think that the keyboard we have here is actually pretty nice looking. It reminds me of the days when HTC Touch Diamond Pro was a big deal… Which model do you think has the potential to become real?